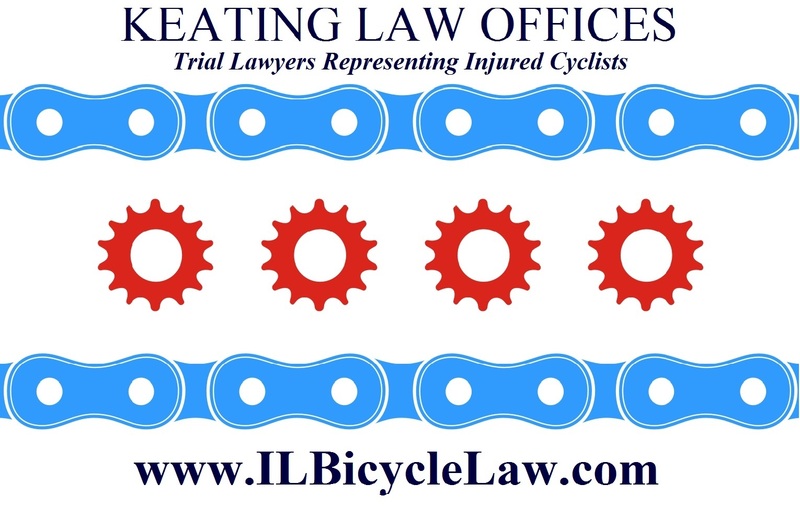 Keating Law Offices has settled a case for a bicyclist that was struck by a car while riding across the crosswalk on North Avenue at the on-ramp to I-90/94. While adult bicyclists are typically expected to ride on the roadway, in this instance the bicyclist had no reasonable choice but to ride on the sidewalk. North Avenue at that juncture has no shoulder and the supports for the overpass are immediately against the roadway. There is often not room for two passing cars, let alone a bicyclist as well. The insurance company for the driver initially argued that the bicyclist should not have been in the crosswalk and should have been in the roadway. However, the attorneys at Keating Law Offices were ultimately able to convince the company this was a unique situation and the motorist was primarily at fault. On July 13, 2010 at approximately 9:25pm, the bicyclist was riding westbound on North Avenue in the marked crosswalk at the Interstate 90-94 on-ramp. The “walk” signal was illuminated at the time. As many riders in Chicago know, it is the custom and practice of bicyclists in Chicago to use the sidewalk along North Avenue and the expressway’s overpass due to the extreme congestion at that location from the narrow roadways and lack of shoulders or curbs. “A person propelling a bicycle upon and along a sidewalk, or across a roadway upon and along a crosswalk shall have all the rights and duties applicable to a pedestrian under the same circumstances.” See 625 ILCS 5/111-1007(c). The argument that in this instance the bicyclist was essentially a pedestrian, and not a bicyclist in the wrong place at the wrong time, led to a successful result. A financial recovery was then able to be made for the injured bicyclist. This case illustrates that "no two cases are the same" and that litigation often requires not only experience but some creative arguments as well.